If you are familiar with the Accelerated Reader program, you know that they can be useful tools for monitoring student comprehension. When my school didn’t renew our AR subscription, I was at a loss because earning AR points was a big part of my classroom reading incentive program. So I created my own program and tests for books in my library—“RIF” (Reading if Fun) tests. I keep track of the tests taken by students, the comprehension rate for the tests, and the points earned. 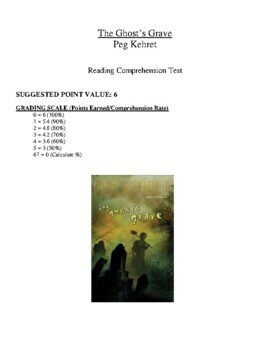 This is my RIF test for THE GHOST'S GRAVE by Peg Kehret. 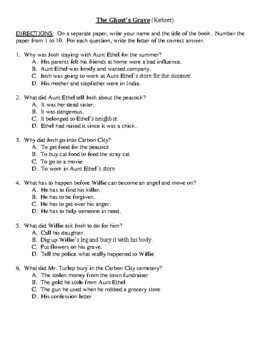 This comprehension test can be used in a variety of ways – as part of a reading incentive program, as an overall test for books studied in class, or to earn extra credit points. If you purchase this test, you will get a 10-question, multiple choice test, an answer key, and a grading/points-earned scale. If you find this test useful, please see my listings for tests for other books.